Click Image for Details or Purchase Below. *Purchases of Digital Downloads must be done on a different shopping cart than items on the rest of the website. If you have any other items in the cart you will need to purchase them in a separate transaction by using the cart icon at the top of any page. The EQUATIONS Mastery Collection PC Download is an encyclopedic anthology of early software programs that teach a broad range of math concepts using an expert computer system capable of playing and monitoring EQUATIONS matches. The DIG Math Program and EQUATIONS Challenge Matches were originally designed to fit into the revolutionary 48K Apple II and PC Jr. microcomputers of the1980’s. We have designed a new and convenient menu interface for the programs and updated them so that they operate on current 32-bit and 64 bit Windows and Mac systems. Both versions maintain the original bare bones graphical interface that harkens back to an earlier age in computing. The content of these programs is profound and will turn any user into a master EQUATIONS player adept in both the strategic and advanced mathematical aspects of the game. The EQUATIONS Mastery Collection Mac Download is an encyclopedic anthology of early software programs that teach a broad range of math concepts using an expert computer system capable of playing and monitoring EQUATIONS matches. 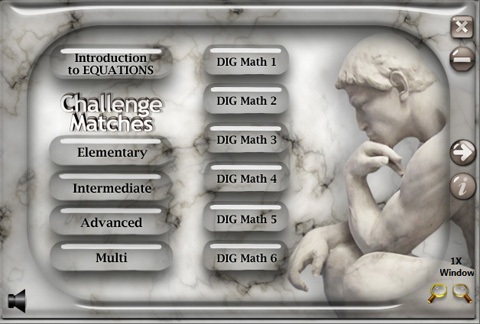 The DIG Math Program and EQUATIONS Challenge Matches were originally designed to fit into the revolutionary 48K Apple II and PC Jr. microcomputers of the1980’s. We have designed a new and convenient menu interface for the programs and updated them so that they operate on current 32-bit and 64 bit Windows and Mac systems. Both versions maintain the original bare bones graphical interface that harkens back to an earlier age in computing. The content of these programs is profound and will turn any user into a master EQUATIONS player adept in both the strategic and advanced mathematical aspects of the game.